Newborns and babies can be extremely gassy. They are constantly eating, digesting and producing gas bubbles which can sometimes cause discomfort and fussiness. It is perfectly normal for babies to fuss or grunt when passing gas, but if your baby is extra fussy, gas discomfort could be the cause. Some signs of gas discomfort include: fussing, crying, bloating, hard tummy, farting, burping and drawing their legs up to their tummy and then stretching out. Gas is inevitable, but there are some ways to possibly reduce the amount of gas that could be bothering your little one. Lay your little on on his or her back and move baby's legs like they are riding a bicycle. Draw one of baby's knees up to his or her tummy, then switch legs and repeat. It may take some time for it to get the gas bubbles out, but keep repeating the bicycle pattern. Tummy time is essential to proper development and prevention of flat head syndrome, but it's also a great way to get gas bubbles flowing. Putting the baby on their tummy puts pressure on the area and can help usher the gas out. Infant massage is a great technique to help baby relax, bond and relieve gas pressure. To help coax the gas out, just think "I Love You." 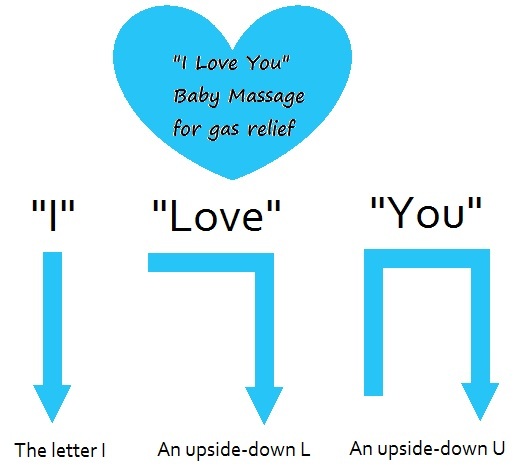 Use your hands to draw an I down baby's tummy, then an upside-down "L" and then an upside-down "U". Over-the-counter gas drops containing simethicone can help relieve gas pain in babies. It is recommended to check with your pediatrician before administering gas drops.